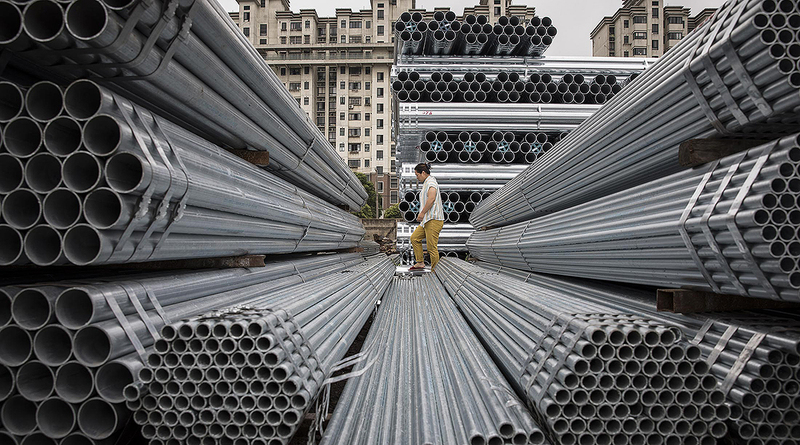 Fresh data on the U.S. economy show President Donald Trump’s escalating trade war is shaping up as a clear drag on growth this quarter. The merchandise-trade deficit unexpectedly grew in August to $75.8 billion, the widest in six months, as exports of food, industrial supplies and autos declined, Commerce Department data showed Sept. 27. A separate report from the department showed corporate investment took a breather, with business equipment orders at U.S. factories falling in August after a run of strong gains, while shipments of those items slowed. Economists at Amherst Pierpont Securities and Capital Economics trimmed their estimates for gross domestic product growth this quarter. Before the Sept. 27 data, the median estimate in a Bloomberg survey was for 3% expansion. While analysts said the trade deficit partly reflected an expected drop in soybean exports after a second-quarter surge ahead of Chinese-imposed tariffs, and economic growth is projected to remain solid, the numbers illustrate how the trade war is spurring volatility in the data. Another report Sept. 27 showed global trade is continuing to lose a little steam amid the tariff battle between the United States and China, the world’s two biggest economies. Freight and logistics company DHL said its trade barometer weakened in September, dropping to the lowest since 2016 and indicating a slower pace of growth in the months ahead. DHL Supply Chain is No. 3 on the Transport Topics list of the Top 50 Logistics Companies in North America. While economists say it may be too early to detect the exact impact from trade disputes, the data bear watching as the headwind and uncertainty look unlikely to dissipate. The Sept. 27 report comes after the United States and China imposed tariffs on each other in late August, which followed others implemented in early July. The U.S. added tariffs on an additional $200 billion of Chinese imports this week — the largest escalation of the trade war so far. The wider trade gap reinforced estimates that net exports are likely to be a drag on third-quarter economic growth after providing a 1.22 percentage-point boost in the previous period. Conversely, August figures released Sept. 27 signaled inventories will give a large boost to growth this quarter, after subtracting 1.17 percentage point from the second-quarter GDP advance. Revised data Sept. 27 showed GDP posted a 4.2% annualized pace of expansion — the fastest since 2014. Stephen Stanley, chief economist at Amherst, cut his third-quarter GDP growth estimate to 2.8%, from 3%. Net exports may subtract as much as 1.5 percentage point from third-quarter GDP growth, according to Omair Sharif, an economist at Societe Generale SA. The latest figures come on the heels of Federal Reserve Chairman Jerome Powell’s remarks Sept. 26 that the economy is having a “bright moment” and the trade tensions haven’t caused a noticeable downdraft in broad data.